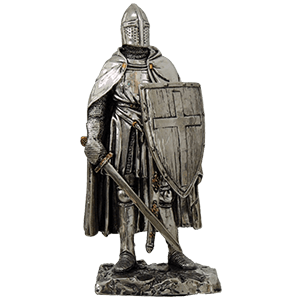 Here in our assortment of knight statues and collectibles, you will find, essentially, all of our items that feature a distinctive knightly style. 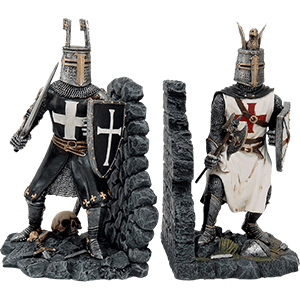 Our knight statues, medieval knight decor, and knight collectibles are ideal for showing off true knightly style in your castle or medieval abode. Knights, for better or worse, are an irrevocable part of the medieval era. Children are raised on stories of their valor, even now, and dream of the days of fantasy when knights would slay evil sorcerers and foul dragons. Real knights hardly hunted beasts of legend, but forged legends of their own as skilled fighters of their times, ones that adhered to codes of chivalry, honor, and other values that are easily forgotten on the field of battle. In homage this warrior, all of our knightly items have the utmost detail possible, ensuring that every little ridge and line of their armor is properly rendered, whether you are looking at a full-sized statue, a little shelf miniature, or even a piece of one of our knightly chess sets. Of course, knights were known as mounted warriors, so we offer statues of knights that are both mounted on horseback and standing on foot. We also offer some of the most famous knights of all time in the form of our Knights of the Round Table sets. Even as battle-hardened warriors in full armor, there is something artistic about these knights, and thus, they make great additions to any room that might need a touch of knightly valor and style. 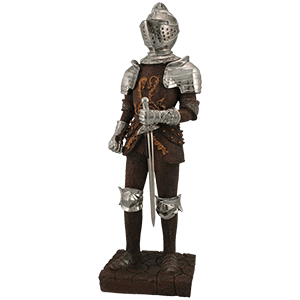 Our larger knight statues are great centerpieces to have if you are looking to add medieval style to your home in a big way. Say, perhaps, you have a love of knights and all things medieval, but you do not have the space to set up a full-sized knight in your own home. Whatever will you do? Do not give in to despair and panic! 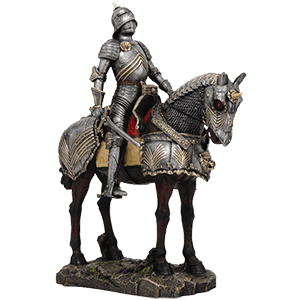 We have a large selection of knight statues that are greatly detailed and perfectly sized, ensuring that you will always have access to a knightly statue to display in your home or office. Of course, our knightly figures come in all shapes and sizes, as many of them wear different styles of plate armor. Many are modeled after the typical European knights of the Late Middle Ages that wore stunning examples of plate when they went to war, although not all knights follow this example. Others are modeled after Crusaders and Templars, who made mail their armor of choice and wore heavy helmets and robes while wielding swords in the name of their faith and their Holy War. That they come in various sizes only means that there is bound to be a knight to suit your need here, whether you are looking to occupy a small shelf with limited space or a large table that looks like it needs a grand knight statue that stands more than a foot tall. Virtually all of them come adorned with weapons of some sort, and some even feature shields. If you are longing to add a few knights to your decor, then here you will find dozens of knight statues that are just waiting to decorate the halls of your medieval castle or appear on your desk or shelf. If you want a statue of a knight as he truly would have appeared on the field of battle or in a jousting tournament, then look no further than our knight on horseback statues. These horseback knight statues depict these medieval warriors as they sit on the backs of mighty mounts, looking quite impressive and intimidating. Of course, intimidating is only one of the words that might describe a fully armored and armed knight as he sits atop a massive warhorse, ready to ride and bring ruin to his enemies. The value of a mounted knight cannot be understated, as the mobility and power of a horse could make a single warrior difficult to defeat, especially if given the room to charge and circle about. These valiant knight statues are quite the impressive sight, possessing an absolutely amazing level of detail, and not just on the knights themselves. Their armor is, of course, brilliantly represented, showing off all the flukes, ridges, and designs that would have been common on knightly plate armor. Even more detail is apparent when you take the knight and the horse together, as the warhorses of many of these statues look as good and as decorated as the knights, if not more so. Together, even the smallest mounted knight statue is stunning, and the larger ones are brilliant pieces that make fantastic centerpieces in any decor, display, or collection. Whether you are a collector and a hobbyist by nature or a medieval enthusiast, you can bet that one of our knight on horseback statues will be a great piece to include in your collection or decor. There is, perhaps, no tale of knightly virtue and valor as famous as the tale of King Arthur and his Knights of the Round Table. 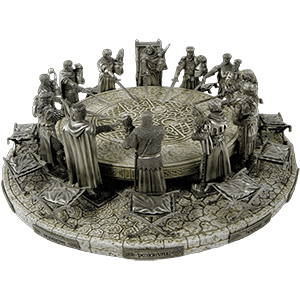 We give a place of special importance to these famous knights, and we also offer a stunning set of models that recreate each knight, as well as the famous Round Table itself, for collectors and enthusiasts to own. Although the origins of King Arthur and his knights are all but impossible to accurately determine, it is theorized that Arthurian legend first originated among the Celtic people, who or may not have based their stories on a Roman warrior or warlord that lived in Britain and thus had contact with Celtic peoples. The stories eventually grew and were passed to France, where they took on special significance, and eventually passed to English and Welsh tradition, as well. Here in this category, both the set of knights with their round table and the individual pieces are sold, allowing you to acquire the knights you desire individually, as well as the whole set. Each of the knights is represented as a stunning pewter figurine, which means that if you are a fan of Gawain, you can get his figurine, just as you can other knights like Galahad, Percival, Bedivere, Hector, and more! The table is also sold individually, so that you can add knights as you see fit. Or you can, of course, just pick up the whole set and let it speak for itself as a grand display to the Arthurian myth, one that will no doubt spawn hours of interesting conversation no matter where you let it sit in your home. Our Knights of the Round Table sets are stunning centerpieces and fantastic display items that will evoke memories of these knights legendary battles and stories of chivalry. At first glance, you might look at any one of our miniature suits of armour here and ask what makes it different from any other statue. Well, a lot of things make our miniature medieval armour suits different, although key among them is that many are not actually statues of knights themselves, but rather are scaled replicas of suits of armour. What this means is that, detail for detail and point for point, these decorative armour sets perfectly recreate the look of a traditional medieval warriors armour as accurately as is possible. Many are crafted in quality metals and are made to be articulated, which means that their arms move and can be positioned in a variety of poses. They come in a variety of styles, ranging from simple looks that feature two-toned armor or shining armor, to more ornate knights that feature engraved armour or decoratively embossed armour. These scale models are a bit larger than your average statue, which means that they have a greater presence, no matter if they are placed on a shelf, table, or even set on the floor. So if you want a realistic knight in your home but also want something that is a bit more space conscientious, then perhaps you should consider one of our miniature suits of armour. They are smaller than full suits of armour but possess all of the detail and are also less expensive, which makes them a great compromise when you are working on a budget or with limited space. 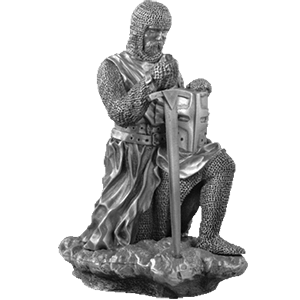 Whether you are seeking a solid pewter sculpture or a miniature medieval figurine, all of our pewter knight statues are impressive pieces to add to your collections or home decor. We carry pewter sculptures based on actual historical medieval and Renaissance documents and findings. Our medieval pewter sculptures include medieval knights, English archers, Highlanders, Templar knights, and Hospitaller knights, to name a few. Our pewter miniatures are often made of cast pewter, and they are typically based on important figures in medieval history or specific warrior classes, often depicted wearing full suits of armour, chainmail, armour, medieval clothing, and holding medieval weapons and shields. These miniature pewter knights are very affordable and make delightful little collectibles or minute display pieces that will fit into any decor. No matter whether you are searching for a truly impressive pure pewter sculpture or a small medieval desk accent, you are sure to find a fine piece of medieval history and culture in our pewter knight statues category. The story of King Arthur, his loyal knights, and his realm of Camelot is a classic tale of fantasy and fiction. Now you can reenact the last of King Arthurs great battles in the form of a chess game by acquiring one of our impressive Arthurian chess sets. King Arthur does much in his life, and those warriors that he gathers by his side are just as noteworthy, as they struggle with dragons and insurmountable odds yet always seem to come out victorious, so long as they adhere to their knightly goals. Arthur himself proves to be a great king, although not one who is above betrayal and, inevitably, trickery and death. This chess set is an amazingly detailed piece, one that features rich imagery that is worthy of such a classic tale of gallant knights and heroic deeds. Here you fill find the chess set in various states of deconstruction and assembly, meaning that if you wish to purchase the whole table, board, and set of pieces, you can. Or if you would rather just own one piece of the set, you can purchase a piece separately too, ranging from the lowliest of pawns to the highest pieces, the queen and the king, down to even the chess board and its stunning display table! King Arthurs figures have a noble bent, featuring noble wizards and even Guinevere as his queen, while Mordreds forces are a bit darker, employing the likes of demons and dark dragons with Morgana as his queen. 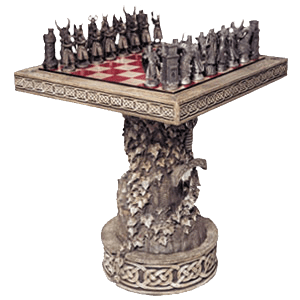 Individually, each piece is a stunning little statue, while together, the whole set is unquestionably impressive, acting as both a functional chess set and a display item that would make a fantastic centerpiece in any Arthurian or medieval display. Chess fans or medieval collectors are sure to love this Arthurian chess set, making it a great choice to acquire for your own usage, either all at once or over a period of time, or to give as a gift to those you might know and care for in your life.